The retina is a layer of vision fibers lining the back interior of the eyeball. 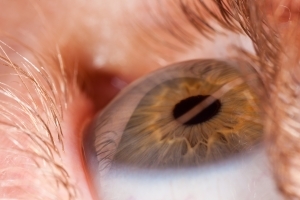 The central part of the retina is called the “macula,” which provides our central vision. Unfortunately, in a condition known as age-related macular degeneration (ARMD) these sensitive vision fibers spontaneously deteriorate. Sometimes this can be mild with little noticeable symptoms. In other instances, it can result in severe central vision loss. Blurred or decreased vision, which often goes unnoticed by the patient early in the disease process. This is because the patients may subconsciously ignore the eye with worse vision prior to development of the condition in the better eye. Blind spots in central vision is a direct result of lost vision fibers in the macula. Straight lines look irregular or bent or objects may appear a different color or shape in each of the eyes. Objects appearing smaller in one eye than the other eye. This may also indicate a swelling and bulging of the macula, leading to a greater distance between the individual photoreceptors, which in turn causes the brain to interpret the object as smaller than seen by the good eye. A certain type of macular degeneration called “wet” ARMD can develop abnormal blood vessel membranes that hemorrhage, causing sudden central vision loss. This type of macular degeneration needs prompt treatment and can benefit from two remarkable medications called Avastin and Lucentis that one of our experienced physicians is able to painlessly administer. If you have macular degeneration or if you are tired of traveling long distances to get your monthly Avastin/Lucentis injections, call 866-770-2020 for your personalized evaluation.